Proposition 487, also known as the Phoenix Pension Reform Act, was rejected by voters Tuesday night by a wide margin. The referendum would have replaced Phoenix’s pension system for new employees with a plan similar to 401(k) used by many companies. The City of Phoenix Employees’ Retirement system currently functions under a defined benefit plan in which retirees are guaranteed payments based on their credited service and age, regardless of returns on the pension fund’s investments. The last time Phoenix passed a pension reform was in 2013, which raised the amount new employees can contribute their pay toward their investment from 5 percent to 14.8 percent. The plan proposed by Prop 487 would have allowed new employees, not the employer, to carry the risk of market performance and require a set city contribution of 8 percent of an employee’s pay. Supporters of the proposition said it would have addressed a drain on the city’s budget and deter pension spiking. According to the Citizens for Pension Reform Committee, the change would have saved taxpayers at least $400 million over the next 20 years. However, opponents of the proposition argued that it could end up costing taxpayers money instead. They said an estimated $350 million in legal fees could be used defending against lawsuits because of the state and local laws that the proposition conflicts with. 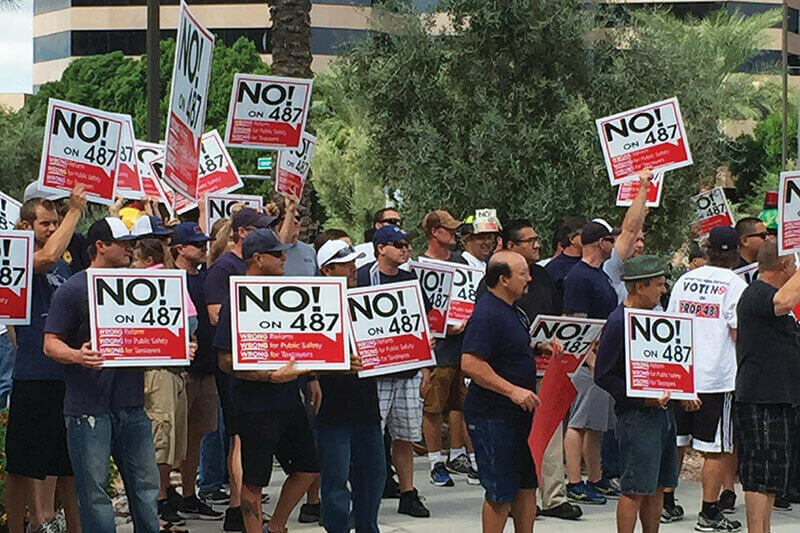 City firefighters had been vocal about their opposition to 487 because they said it would eliminate disability-retirement and death benefits provided to public safety employees under the city’s pension system. Catherine Alonzo, a spokeswoman for Fire Fighters Opposed to Prop 487, the group leading the fight against the measure, said that Phoenix voters made the right choice. “They made a decision that was ultimately good for taxpayers, good for Phoenix public safety and good for the community as a whole,” she said. Vice Mayor Jim Waring, a supporter, said although voters decided that Proposition 487 wasn’t the way to fix Phoenix’s pension issues, something still needs to be done. “If you were against this initiative, now’s the time to step up with your plan to solve this problem,” he said. Reprinted from Cronkite News. Article by Carlene Reyes, Cronkite News. Read the original story here.